Yi-Tan Community hosts a weekly 40-minute conference call about navigating change in technology and society. Jerry Michalski is the moderator. I used to participate in the calls way back in 2005 in the early days of blogging and always found the calls informative. Yesterday’s Yi-Tan call with Jerry Michalski was about Google +. Charles Warren who was on the Google + team was on the call. Google sees granular privacy controls as a way to spark more sharing because people will feel more comfortable and not just lurk. According to Warren, Google looked at the mental model of the person who isn’t sharing online and how Google could inspire them to share with more trust and control. Warren referenced 1/9/90 rule of online community sharing – that 90% of people lurk, 9% share regularly, and 1% share a lot. He didn’t go as far a saying that granular privacy controls would spark a revolution in sharing, but someone on the call mentioned research by Norman Sadeh to support this theory. Google + intends to make us more intentional about who we share our information with. Google started with the asymmetric model of sharing first because it is hard for people to grasp. We also talked about the need for better filtering, especially if more people are going to share and as Google opens the doors. I want to be able to bookmark or pick things out from the stream that I want to go back to so the items don’t get lost. Also, there’s search yet. In the meantime, people are coming up with workarounds. We also talked about how circles are different from communities. I really want better community management options such as open or shared or topical circles. I also learned that one of the design personas was an individual who was therapist who needed to keep a professional wall between her work and clients – much the same issue that educators have in friending students or their parents. This might be of value to nonprofits that need this sort of granular privacy control or many professionals, but of course it all depends whether this platform becomes a mainstream hit and that’s unclear. Dave Gray shared this reflection where circles can go and they hint at other potential nonprofit use cases for donor cultivation. Right now, the asymetric sharing can result in fragmented conversations and lack of social context, although not everyone thinks that is necessarily a bad thing. 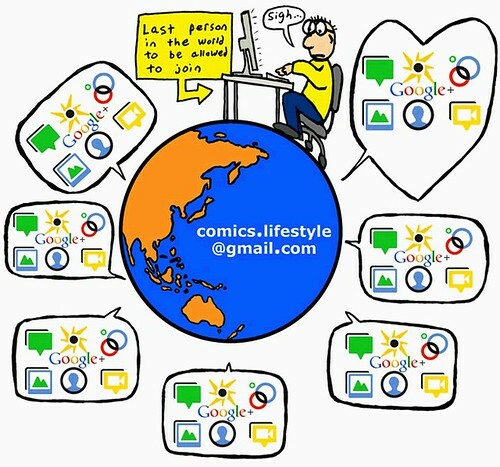 Google + is not necessarily just a new platform, but it is the glue that ties together Google’s communications products. And while there is some debate as to whether or having that beckoning red button lets you know people have commented on threads integrated with your email, calendar, and other work tools is good or bad for productivity – it is just too early to say and depends on the person. I, for one, would love the option to hide it. Warren noted that in their tests people became blind to the red button which I’d like to call the social procrastination button. What interests me most is the whole concept of circles and this design is based on something called “intimacy grades.” It isn’t new – a lot comes from the early discussions of social software and networks and some early adopters say the energy is similar to birth of blogosphere and early social networking back in 2003. Not everyone I want to share with is on Google+. No family members or close friends yet. Not all my professional colleagues are here either. For example, not all my colleagues in Cambodia got on and some are feeling left out by the exclusiveness of the beta process. It isn’t because the beta is limited to people in the US, because a number of nonprofit technology colleagues did not get an invitation. That will change as Google+ opens up. And, of course, the Facebook VS Google War has just gotten started. According to Wikipedia,Gmail has 193mm users, so even if Google plus integration starts, they’re still behind Facebooks 600m+. FB has already made nods towards improving their communication inbox features, it’s a feature war says Jeremiah Owyang. So for now, I’m doing light experimentation and watching as the platform matures. As they roll out features for organizations (the equivalent of FB pages, right now some folks are using individual accounts this way) and integration with Google +. the nonprofit use cases and potential will become clearer. The “Is it worth it?” can be bettered answered. I’ve hit one snag with g+ regarding the new sharing model: They force you to share your profile name across all google tools, even those without the stellar granular permissions. So, if I want to use my full name to be found and recognized in g+, it will be available elsewhere, no option to change. The biggest issue with this is using google account to publish comments on websites. I work in a field where emotions run high and people who love guns get really angry about wildlife management…sometimes I want to remain anonymous! I don’t want to use my full name on g+ until I know it won’t suddenly populate my profile name across all my old comments. That use of your full name seems the most basic of sharing issues; I am surprised they would force that across all google tools.